Thank you for your interest in our charity. We’ve spent almost 100 years making life safer on the roads, in the home, at work, and at leisure. As a charity we couldn’t have done it without the help of those who share our mission to save lives. Together we can stop the millions of accidents that are waiting to happen! Even Tufty, our retired road safety squirrel, is getting in on the action! • Destroy families and diminish communities. Donations will be used to help fund RoSPA’s key campaigns and to support the policy and public advice we offer for free. Why not join us in our fight to keep families safe? 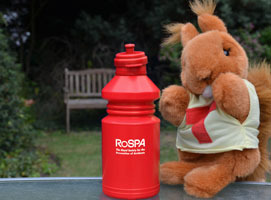 For more information please visit www.rospa.com/fundraising/. If you have any questions, give us a call on 0121 248 2076 or email fundraising@rospa.com. Good luck and thank you again for your support!